It's 2 a.m., and you awake to the sound of your home smoke alarm going off. You smell the smoke, and hear a faint crackling sound. 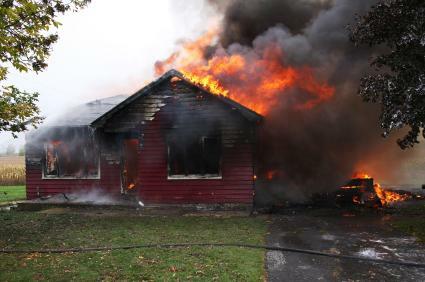 Your groggy brain tells you it's a fire, and your first thoughts are of getting your family to safety. Your very next thoughts are about calling the fire department, but every second you lose puts you that much closer to tragedy. What do you do first? The standard procedure for reporting a fire involves calling in a report to the central fire station. The central dispatch then transfers the call to the closest firehouse in that area. Although this will send help your way, it's not always the fastest or most convenient method to use. A direct to fire department notification system electronically reports a fire as soon as it's detected, leaving you free to concentrate on getting everyone out safely. Just like other security alarms, the proper authorities are alerted immediately when the alarm is triggered. Ultimately, this can result in a quicker response time from the fire department, and quicker responses can equal saved lives and property. A direct to fire department notification monitoring system can make all the difference when every second counts. A recent study conducted by Leber/Rubes Inc. confirms that an electronic fire notification system shaves significant seconds off response times. The report was funded and conducted at the request of Fire Monitoring Technologies International, Inc. Its Open Access fire monitoring system was used in a series of 95 tests conducted in cooperation with the local fire department. The purpose of the study was to track the difference in response times between standard central station monitoring and a direct to fire department notification system. The study was independently monitored by the Insurers Advisory Organization in Ontario, Canada, and the results showed the average response time was approximately two minutes faster when a direct to fire department monitoring system was used. A direct notification fire safety monitoring system is quite different from a standard smoke alarm or fire bell. The Ultra Violet/Infra Red Flame Detector requires the presence of both IR and UV radiation, as found in most fires, to set off the alarm. This fire monitoring system is enclosed in an explosion-proof housing, so you can depend on it under the most extreme circumstances. The Single Ultra Violet Flame Detector carries many of the same features of the other monitoring systems, but has the additional capacity to detect ammonia, sulphur and hydrogen fires. Whether you need to protect a home, school or workplace, a direct notification fire monitoring system definitely delivers an advantage over conventional fire alarm systems. When life and property are on the line, it makes sense to use the best alarm you can afford. If you want additional information on how to protect yourself and your family, contact your local fire safety guard.